Rik Mayall is 'Richie' Richard Richard - He's nice in a smarmy, creepy, disgustingly oozy, oil-tongued sort of way Adrian Edmonson is Eddie Hitler- the kind of person you cross the road to avoid. This monolith of a box set features all the live shows that messers Mayall and Edmondson have done under the guise of these two detestable characters, Richie and Eddie. Eddie: My Great-Uncle Percy was in the trenches of the first world war. You know what he used to say? Eddie: AAH! BLOODY HELL! GERMANS! THOUSANDS OF 'EM! AARRGGHH! It's a shame that it's tarnished by the truly appalling Guest House Paradiso, but great value all the same. Good find OP. Big Bottom Box Sets make the world go round. Bottom Live 1 & 2 are great... it gets worse and worse each one after that - far too much messed up lines and playing up to the crowd. The characters are barely distinguishable from the tv series in the later shows. It's a shame that it's tarnished by the truly appalling Guest House … It's a shame that it's tarnished by the truly appalling Guest House Paradiso, but great value all the same. Good find OP. Paradiso was funny for an hour but totally lost the plot at the end! Absolutely loved bottom but for some reason the live shows have never done it for me. I've not seen Guest House Paradiso for quite a few years now, but from what I remember it seemed to contain a rehash of a lot of the jokes used in the TV Series, nice find btw have some heat..
You have to love the live shows. Richie: Whatever shall I do now? Audience member: Have a w*nk! I'd been thinking about making a purchase, so thanks. WHAT THE F HAPPENED THERE?!!! WHAT THE F F F F F FEDY F HAPPENED THERE!!! I wonder how much meat you get on a womble.....? This has been on before. 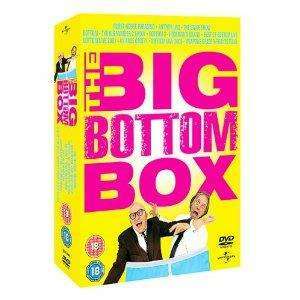 Is there a super big Bottom boxset which has the tv series in it aswell? Quality Price for a quality series.